A successful day at the office begins with the right solid wood furniture. The Amish Buckingham Corner Desk with Optional Hutch Top provides the spacious workstation you need to stay organized as well as a beautiful solid wood desk to define your office decor. 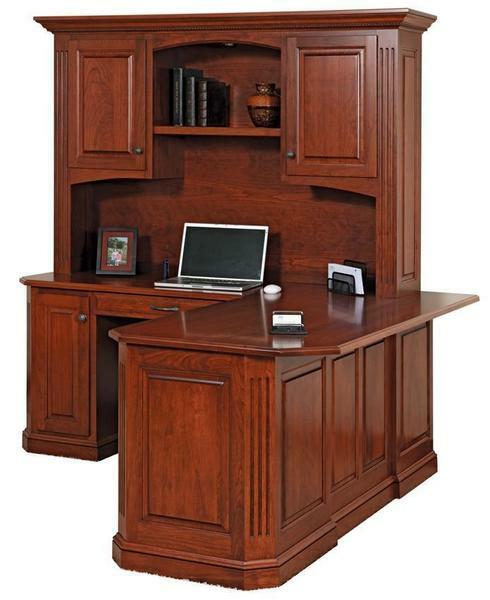 The stunning solid wood Buckingham Corner Desk provides an ample desktop to support work projects, file drawers for important records and a stunning hutch top to provide shelving for books, family photos, and awards that personalize your space. DutchCrafters Amish furniture offers key customizations to make your furniture work best for you. All of our solid wood desks are Amish made in America. Be sure to review our helpful blog post "8 Office Desks That'll Get Your Job Done," for an in-depth guide to office desks and their style and functions. Our line of Amish Desk Chairs offers numerous styles to match your solid wood desk. Call one of our Amish Furniture Specialists today at 1-866-272-6773 with any questions. I’m sorry I have not responded! I LOVE my furniture! It is even more beautiful than I ever could have imagined! See attached for two pictures of my furniture right after it was setup and a video of it after I decorated my office a little.